I feel like the stupidest prettiest person ever. I have too much on my plate and it’s my phone that’s stupid. My phone is a 3G iPhone, not 3Gs not 4 or even 4Gs. My stupid phone doesn’t even get software updates anymore. I go to type a status and my fingers move faster than the keyboard, letters get missed, end of words don’t appear and my cousin eats me alive. To be fair, it WAS hilarious. My friend started the bashing. But still…. I HATE IT WHEN I GET CAUGHT BEING STUPID PRETTY!!!! In my family we have a saying when someone does something … not very bright or less than ideal, we tilt our head, say “You’re so pretty” and smile at them. I don’t think I have ever said this to my son, but my daughter hears it, my father hears it, my sister hears it…. then they said it to me. CRAP! Then my cousin weighs in and spells smart S M R T…. nice – again I laughed but geeze…..
We were all in the car and having a discussion about various sciences – that’s right, I live in THAT family. I had asked my son what science Meteorology falls under and before I could explain what I meant, my son says very dry and very sarcastically… “meteorology” Damn… I was caught with my pretty on. What I intended and what I said were very different things. I meant to ask him what science class would it be in Chem, Bio or Physics. Ya… too little too late, I was busted pretty and they had the last laugh. For the record I hate kids. Especially mine. I wanted a baby not a teenager. My Ex father-in-law had a thermometer hanging out his truck window…don’t ask, but I looked at it and asked how could it be that accurate when you are driving? I did not mean the AIR MOVEMENT that creates windchill, I was thinking in terms of vibration. The possibility of the alcohol or mercury vibrating within the tube. Ya… he assumed I meant windchill…and he laughed his head off and I was forever branded the stupid one. Ya well… dude you had NO ROOM TO TALK! My boy claims me not taking the time to set up MSWord and adjust fonts, headers and have him do it makes me pretty. Apparently, the headset and mouse not working because they are plugged into the WRONG USB makes me pretty. I think that just makes me lazy…not pretty. I also think I am resourceful to make someone else do the work for me. 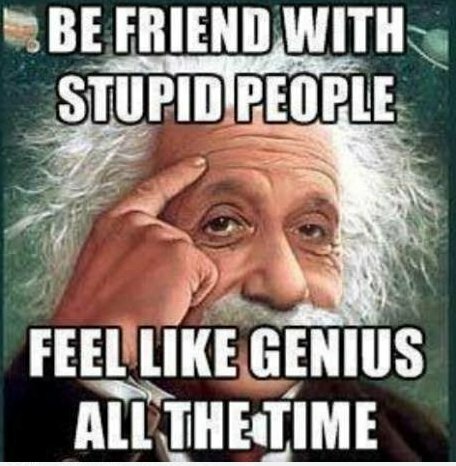 That makes me GENIUS not pretty. Note to self: Think before you act, proof read from the smart stupid phone and lazy=pretty in my children’s eyes. It’s going to be hard work not being pretty now that my kids are smarter than me. Reblogged this on Alyse – Striving For Greatness (Or at least something close to it!). I am so pretty too. Thank you for bravely, intelligently and kindly travelling through life. Nice to have bumped into you on my journey.